Time is moving waaaaaaay too fast at the moment, but now that Halloween is over I will probably be getting more and more excited with the prospect of Christmas approaching. Christmas really is my most favourite time of year so I'm really looking forward to celebrating everything November has to offer and moving gently into the full swing of the season. 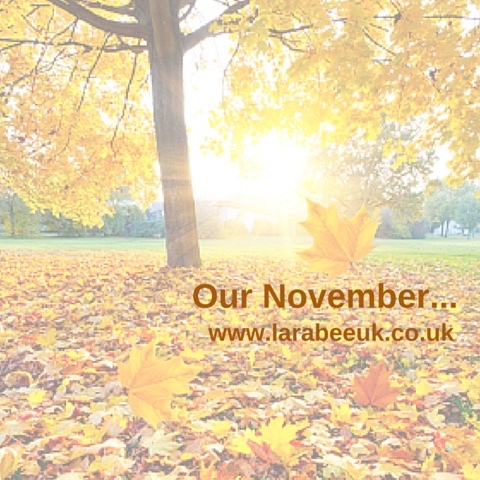 We don't have much planned in November because it's generally a busy time for us at work, so most of our activities and trips will be impromptu and I'm actually looking forward to that. Today (1 Nov) we are off to do a riview for Harvester and hope to call in to a country park on the way back to walk off our indulgences. I have also signed up to Blog each day in November challenge #bedn to try and get me back into more of a routine. I also am starting a little challenge to myself which will be to do something towards Christmas each day, you can check out my progress on that on Instagram and Facebook if you like. You can join my Christmas 365 group too if you like? November is pomegranate and sweet potato month. It's the first month of our Winter bucketlist, check back tomorrow to see what's on our winter bucketlist this year!